The companion cookbook to the new PBS-TV series starring the New York Times bestselling authors of Protein Power and The Low-Carb Comfort Food Cookbook. With their 4 million-copy New York Times bestseller Protein Power and the recent success of The Low-Carb Comfort Food Cookbook, Drs. 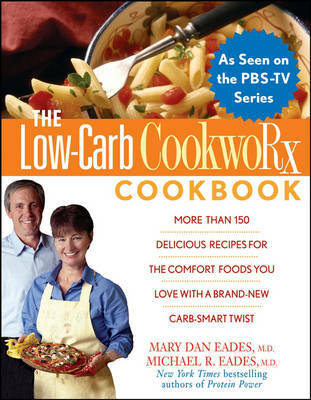 Michael and Mary Dan Eades are established stars of the low-carb dieting movement. Now, with their new public television series Low-Carb CookwoRx - premiering in spring 2005 and airing on an estimated 80 to 90 percent of PBS affiliates - the Eades are poised to take their stardom to a new level. The Eades serve up old-fashioned American comfort food with a brand-new low-carb twist, and The Low-Carb CookwoRx Cookbook represents the very best of their innovative - and satisfying - approach to low-carb cooking. Drawing on the authors' passion for simple cooking, their love of great food, and their unrivaled expertise in nutrition and weight loss, the book presents more than 150 easy low-carb recipes, including deliciously guilt-free versions of favorites like Belgian waffles, spicy enchiladas, Southern fried chicken and gravy, and crème brulée. From breakfasts, appetizers, and entrées to salads, desserts, and snacks, the recipes are both simple to prepare and terrific to eat. Complete with 16 pages of full-color photographs showing finished dishes as well as scenes from the series, this cookbook will be welcomed by the over 40 million North Americans who are currently watching their carbs.